Click image to enlarge - Blue and yellow lichen on Mount Stuart rock. Like most larger Australian coastal settlements, Townsville has grown around floodplain river systems. The Ross River, and the nearby Bohle River, Haughton River and Reid River are all part of a wider catchment area and the health of these river systems and local groundwater is an important part of the overall state of the local environment. Inland waters are defined as all underground and surface waters both fresh, brackish and estuarine. The nationally accepted indicators (ANZECC Team Study 2000) for inland waters are grouped under three categories: Groundwater; Surface water; and Inland aquatic habitats. It is often difficult to determine the condition of inland waters but clearly it is vitally important to try to assess the condition of streams, creek and rivers. Another important influence on groundwater quality is the volume of water extraction. Surface water considerations include the amount of deep-rooted vegetation by catchment; volume of surface water extraction; maintaining environmental flows; limiting and managing point source discharges; surface water quality management; managing freshwater algal blooms; and wastewater treatment & management. Aquatic habitat issues include vegetated stream length; river health; and extent and condition of wetlands and fish stocks (ANZECC Core Indicators 2000). Riverbank vegetation is known to protect water bodies from pollutants, it guards against excessive erosion, and is an important energy and nutrient source (litterfall) for aquatic ecosystems. Because Townsville is near coastal estuarine environments and the stormwater system is predominantly influenced by fresh water or rainfall run-off, stormwater management has been included under this section. Some of our ecosystems are subject to change depending on rainfall variability, physical proximity to sea (tidal influence) and year to year salt concentrations in the water For example lakes remain fresh during years of greater rainfall, gradually changing to saline in dry periods and reverting to fresh from saline in a matter of days under very high rainfall events – greater than a first flush). In addition point source discharges and stormwater systems combine to produce flushes of variably concentrated pollutants. These ‘rogue’ pollutants end up in drains and await first flush rainfall events to carry them into our creeks and waterways. Information on environmental flows for urban tropical catchments and modified savanna woodland habitats is not readily available at present at an appropriate scale for local governments. However, Townsville City Council is leading the way to manage stormwater and create greater inland water flows sufficient to protect fish habitat and regionally significant wetlands. This follows a decision by the Council of Australian Governments (COAG) in 1994 to ensure that stormwater and wastewater should be used to maintain environmental systems where adequate water quality is maintained. Other groundwater areas vulnerable to contamination and extraction are associated with sand mining operations in beach ridge areas of Clevedon-Cungulla. These groundwater aquifer areas are believed to be interconnected with the adjacent RAMSAR listed Bowling Green Bay National Park and consequently require special attention. Surface waters in Townsville can be categorised into runoff from urban environments and runoff from rural or rural-residential areas. Rural areas include conservation and national parks, dam catchments, rural residential land, grazing properties and minor horticultural areas (e.g.. tropical fruits). Water catchments have been mapped (see map). These areas include substantial areas of seasonally inundated lands and wetlands (aquatic habitats). Following heavy periods of intensive rain the whole low lying region becomes like one aquatic habitat and surface waters interconnect across the landscape rather than along rivers, creeks and drains. Many areas within Townsville’s urban environment retain some characteristics of natural aquatic ecosystems (lagoons, dams, ponds). There is usually connectivity between these areas and the cities stormwater drainage system. Pressures such as man-made river structures (Ross River Dam, Aplins weir, Black weir), sedimentation, river dredging activities and the extent and condition of riverbank vegetation must be assessed in relation to the management of these systems. The location and number of point source discharges into inland waters, including the type and volume of polluting materials discharged is very important for ecosystem management (e.g. water, sediment, nutrients, chemicals and heavy metals). Exceedances of acceptable surface water quality parameters can lead to either periodic deterioration in local and regional water quality or possibly long term permanent deterioration where aquatic diversity is irreversibly reduced. This can also occur through physical modification of natural creeks and rivers through earthworks (channelisation & straightening) and removal of deep-rooted vegetation cover and weed infestation. It is recognised that there are regional differences in environmental values of water and baseline environmental water quality conditions (ANZECC Core Indicators 2000). Environmental impacts on the stream-beds and banks are also important issues. The impacts of pest fish species, modifying rivers and variations in riverbank vegetated stream length are also important factors in keeping ecosystems stable and sustainable. Water storage allocation for competing uses (environmental, domestic, industrial etc.) in relation to total water availability must also be addressed. Stormwater, particularly polluted stormwater, is a major environmental issue facing all urban areas. Managing stormwater requires an integrated and collaborative approach. The whole community must share the responsibility for ensuring the quality of stormwater entering our waterways is improved. Trialing different techniques and technologies, and sharing information on how to manage stormwater quality, will benefit all. Pressures on aquatic ecosystems modify and change natural systems. These changes include; reclaiming and filling land, increasing pollution levels, and the introducing exotic weeds and fish. When riverbank vegetation is removed it can promote the growth of exotic grass beds (guinea grass) which in turn leads to altered fire patterns, subsequent damage to native vegetation preventing creek bank tree regeneration. Riverbanks are also important dry season refuges for wildlife. Their loss or damage reduces available resources for wildlife and alters water quality by removing shade (increasing water temperature). Clearing of riverbank vegetation has historically occurred in localised areas especially with urban development, but also in areas cleared for agriculture. There is some quantitative data on the effects and impacts of such changes, but most data is observational and anecdotal. North Queensland faces the challenge of managing tropical catchments, with highly variable climate (heavy intensive rainfall over short and long periods, and long dry seasons). In addition, North Queensland's coastal catchments drain into the Great Barrier Reef World Heritage Area (Cleveland Bay), a sensitive ecosystem valued by all Australians and the international community. Council has a special responsibility to ensure that catchments are managed to a high standard to reduce threats to this internationally significant reef system. In order to avoid ecosystem degradation, environmental impacts to wetlands and waterways need to be controlled, taking into account the privileges and obligations of private owners and the Council's responsibilities for the local area for the benefit of the entire community. Urban development increases runoff rates due to the increase in sealed surfaces (with subsequently lower surface water infiltration). Because of Townsville’s flat, flood plain topography, the engineering emphasis has been on flood mitigation by modifying waterways to rapidly drain water from urban areas. Upstream areas, which drain quickly, either by design or poor land management, will cause downstream areas to flood more quickly if drainage systems are not designed to carry such increased runoff loads. In such situations, greater emphasis on water detention and retention systems is needed in order to mitigate the impact on downstream areas. The Lakes development in West End/Currajong is an innovative example of such an approach. The short, highly variable wet season experienced in Townsville necessitates a drainage scheme capable of accommodating severe floods and extended dry periods. There are therefore opportunities to utilise drainage areas for alternative planned uses, such as recreation and creation of wildlife habitat, as well as being designed as gross pollutant traps to reduce the impacts on the coast. The region is noted as having significant groundwater resources (unconsolidated sediments and fractured rock) and these resources have been mapped for Townsville and Thuringowa, based on aquifer bearing sediments and rocks (TTSP Natural Resources Management Policy Paper). Mapping is based on Townsville 1:100,000 geological series maps (DME 1986). Unconsolidated sediments are considered the best for groundwater infiltration and storage, and it is considered that groundwater quality is variable throughout the region (TTSP). Information and data on the condition of these resources is based on bore hole logs, yield data and personal experience (TTSP). A detailed analysis of the condition of groundwater resources is documented in the TTSP Natural Resources Management Policy Paper (1996) and includes data on the generalised characteristics of the different aquifers. The TTSP noted that groundwater extraction rates are exceeding annual recharge water levels for the areas within Thuringowa (Black and Alice Rivers – 5,000 mega-litres per annum being extracted). In the low lying area of Alligator Creek to Nome it is considered that higher yielding bores can lead to extraction exceeding natural recharge during drought years. The TTSP also noted high levels of groundwater use in three areas of Townsville LGA at Alligator-Whites Creek; Woodstock and Middle Ross River below the dam. This is a potentially serious threat for the region given the large projected increases in local population over the next decade and beyond. Townsville City Council aims to improve the water quality of the local region in line with the recently released ANZECC Guidelines for water quality. However, as with many other urban environments across Queensland and Australia, Townsville City Council has learned that methods required to manage our urban stormwater are very different from those employed elsewhere, especially in non-tropical environments that have very different seasonal weather patterns. At present little research has been conducted on stormwater quality issues in tropical urban catchments. Townsville City Council is leading Queensland in this regard. Information currently being gathered will be of great value to all Councils, communities and environmental engineers. Council recognises that sound catchment management is required to control the severity of flooding in urban areas, as well as the need to protect the integrity of waterways and wetlands. Point Source discharges to stormwater are regulated by the EPA and Council (Environmentally Relevant Activities, Schedule 1 listed under the Environmental Protection Regulation 1998). So far TCC has licensed and approved 600 activities (e.g.. motor vehicle workshops; woodworking, and metal works). These activities have been required to undergo modification to include separation of activities, removal of risk of contamination and detailing procedures for spills and contamination. Septic systems are currently regulated under an agreement between local government and the Department of Natural Resources & Mines (Agreement for On-site Disposal of Septic Sewage). This details requirements for waste disposal and the minimisation of harm to the environment. However many septic systems were installed prior to such regulatory requirements and tropical environments face difficult challenges in managing septic seepage from disposal systems. Though some contamination is known to occur from time to time at certain locations (Picnic Bay and Gustav Creek) current levels of monitoring make it difficult to determine cause and effect (ACTFR Gustav Creek Catchment Study 2000). Monitoring and sample analysis is also expensive to conduct. Currently little is known about groundwater extraction issues and rates. The Department of Natural Resources, Water Resources Division manages the regional groundwater system. Within Townsville there are currently no declared areas (TTSP Natural Resources Paper). The condition of waterways and creeks has been recorded at varying scales for 62 sites (Atlas of Environmental Values - TCC Urban Stormwater Management Plan 1998) and in both Wetlands Mapping (ACTFR) and in TTSP (Nature Conservation). Townsville rivers and catchments are part of both the Ross-Black Catchment Area and part of the Burdekin-Haughton Catchment Area. One-third of the Townsville LGA is actually in the Haughton Catchment – Major’s Creek tributary and Reid River is in part the City southern boundary. Within the Townsville region, works are focused on minimising the impacts from urban stormwater on local ecosystems and enhancing natural habitats. The condition of watercourses such as Ross River, Ross Creek, Alligator Creek, Majors Creek, Sachs Creek, Anthill Plains Creek, Stuart Creek, Lansdowne Creek, Bohle River,Bohle River to Cape Pallarenda Foreshore, Gustav Creek and the Haughton River all exhibit varying degrees of anthropogenic influences which must be reduced, removed or rehabilitated (sediment, nutrient and chemical pollution; exotic weeds growth; and physical bank and bed modifications). Varying levels of riverbank native vegetation and grasslands exist in our water catchments and creeks. The following documents (reports and plans) can be referred to for detailed information on the conditions of catchments. Although there are catchments with high native vegetation condition and little disturbance in the lower parts of catchments (Killymoon Creek; Stuart Creek; Gustav Creek) most areas are highly disturbed outside of creek and wetland riverbank vegetation. This is in contrast to the hills of Townsville, which are often close to pristine. The Community Plan for Natural Resource Management in Townsville-Thuringowa produced by Townsville Thuringowa Landcare Association (TThLCA) in collaboration with community groups, both Councils and various State Agencies also has information relating to catchment condition and issues (Appendix J: Proposed Catchment Management Units). See below for full Landcare text - Section 3. Water, Wetlands and Waterways. There is also river and creek disconnectivity across the floodplain. For example the location of the landfill at Reid Park between Ross River and Ross Creek (see Ross creek scoping study) that has now reduced integration with other parts of the river system. Along the Ross River and Alligator Creek it is also evident that weirs have an adverse impact on environmental flows and on fish migration between fresh and estuarine habitats. The riverbanks of most local watercourses are steeply inclined in their upper to middle reaches. River and creek beds are generally sandy on well major watercourses in Townsville. Sand deposits are evident on the inside of stream/river meanders and at the intersection of major rivers and streams (TTSP NRM Policy Paper 1996). Rubber vine is a noxious weed which damages much of the vegetation of inland waterways. This, along with excessive growth of guinea grass alters fire patterns and results in late dry season hot fires and subsequent impact on river health and water quality. Current regional water quality conditions are presented in data in a report on the quality of Queensland waters, prepared by the Environmental Protection Agency in conjunction with Department of Natural Resources. The data suggests that water quality within the Townsville region is good in relation to turbidity, dissolved oxygen, conductivity and nutrient loading. Water quality research undertaken at sites in Cleveland Bay, Gustav Creek, Horseshoe Bay, the Bohle River and other sites within the region indicate that water quality complies with current guidelines. The EPA water quality monitoring ran for 7 years with stations visited monthly in the Ross River estuary (two stations) and the Bohle River (five stations). EPA funding priorities changed and program finished in 2001. There were no distinct trends in the Ross River estuary, however, there were big improvements in the Bohle River as a result of upstream landuse changes. Click here to see EPA water quality graphs. occasional significant concentrations indicate widespread diffuse inputs or at least multiple sources i.e. Septic systems). It has been concluded from available water quality data that bacteriological pathogen levels of Gustav Creek are quite satisfactory for most of the year and certainly do not represent a health risk for residents in secondary contact recreational activities (A.Hesse, 2000). It has also been noted that high faecal coliform concentrations are often encountered in tropical creeks and smaller waterways in particular during prolonged dry weather/and or after initial wet season rains. High pathogen counts are not restricted to urban environments but are also observed in protected areas such as Bowling Green Bay National Park (A. Hesse, 2000), which demonstrates that even pristine aquatic environments are subject to natural polluting events given the right climatic and environmental conditions. Lakes. Regrettably, numerous undesirable events have occurred within the Lakes development in recent years. High levels of nitrogen and phosphorus enter the lakes system during rainfall events. With large rainfall events in both 1998 and 2002, algae blooms occurred, with dissolved oxygen levels being significantly affected. This changes the chemical dynamics of the system and can cause catastrophic events, such as large fish kills. Under these conditions the quality of the whole system suffers and as such, both short and long term remediation and monitoring is required. Council has undertaken significant remedial work in an attempt to mitigate these types of impacts. The use of activated carbon removes nutrients from the water and improves water quality. Monitoring is being undertaken, and current investigations are being conducted which aim to minimise these types of events in future (Lakes Environmental Management Plan). Ross Creek. Ross Creek Scoping Study determined that there was historic pollution to Ross Creek resulting from the development of the port and river. The study also demonstrated the importance of the remaining mangroves as fish habitat and sediment stabilisation. Ross Creek is now the focus of the CBD Urban Renewal project and with the attention in this project being directed back towards the waterway itself (see CBD Master Plan). A CBD Review of Environmental Factors has been produced and details environmental considerations relating to the CBD and Ross Creek in particular. Louisa Creek. Louisa Creek is an urban waterway receiving substantial volumes of urban run off. It retains remnant riverbank native vegetation, good creek bank condition and fish habitat despite being significantly modified (straightened and channelled). Water quality is generally good (SKM 2000 & Skene 1999) except for dissolved oxygen, which is often low in the late dry season (Skene 1999). Despite tall native melaleuca trees the creek is degraded by exotic grass (para-grass). As urbanisation has replaced agriculture and grazing, this grass has become prevalent. pH results fall within ANZECC guidelines, conductivity can be low due to wet season rains and would be expected to be higher at end of dry season. Total nitrogen concentrations range from 0.4 mg/L to 3.9 mg/L which is an order of magnitude greater than expected for "pristine" coastal freshwater aquatic systems. However SKM (2000) considered that such levels are consistent with partially degraded freshwater systems such as Louisa Creek. Macro-invertebrates were sampled once, post-wet season by Skene (1999). 12 samples were collected from two sites and four habitats. The number of families collected per site ranged from 4 to 15 with an overall total of 34. The number of individuals ranged from 24 to 237. The level of variation between samples was common. The families collected reflected the predominant habitat sampled, that is, slow or still water amongst vegetation. Most invertebrates were surface dwelling or commonly associated with vegetation, and found in pools or temporary water bodies. The two bed samples from coarse sand showed low diversity and high abundance which suggested some form of impact to researchers. The SKM report considered that this might be true, particularly with regard to low dissolved oxygen level, but considered that one would also expect the taxa to be most abundant in this habitat. It was noted that chirominds are often the most abundant group in pristine systems. The fact that the mudwhelks were found only at site 6 along Louisa Creek was considered odd, and perhaps reflecting greater aquatic plant abundance. Insects studied were found in surprising low numbers and this was considered to reflect the very low dissolved oxygen levels and lack of leaf litter (ie. Poor riverbank tree diversity compared to exotic grasses – paragrass). This was probably based on observational data as the area has a high exotic grass cover with little leaf producing tree diversity and abundance. Skene 1999 recorded a total of nine fish species (five native and four exotic). Skene made observations of large schools of Tilapia and caught natives Rainbow fish (Melanotenia splendida), Spangled Perch (Leipotherapon unicolor), Glass perch (Ambassis spp), at Tarpon at different locations within Louisa Creek. Skene captured one turtle and large ones are often observed in upper Louisa Creek and middle. Barramundi have been recorded in Louisa Creek and this was confirmed with the death of 20 found following a natural fish kill in January 2002 (V.Vetch pers. com.) and a further 8 fish in December 2002. Exotic fish captured besides Talapia included mosquito fish and guppy. The presence of Tarpon, Barramundi and sign of Long-fined eel (Skene 1999) demonstrate connectivity to the coast. Community based research by the RIVER Group has also made a valuable contribution. This research, supported by Townsville City Council, added to scientific knowledge on important matters including the condition of important breeding colonies for birds and flying foxes, the condition of riverbank vegetation communities, the health of rivers as reflected in the distribution and prevalence of mudwhelks and other molluscs, and the number of fish species and their distribution. This provided important scientific information not previously recorded. RIVER helped to raise awareness about the high environmental values of certain places (eg. the Ibis, Egret and Flying Fox roosting and breeding colony amongst the mangroves on the south bank of the Ross River). It also helped to involve Townsville residents in important hands-on environmental works. Finally, RIVER also produced a series of Field Guides which can help local residents and planners alike to better appreciate and factor into their activities the environmental values in the river habitats of Townsville. Freshwater jellyfish are little known and found in slow flowing waterways, small ponds, man-made reservoirs, dams, and ornamental fish ponds. Typically found in the summer months in all continents and throughout SE Asia - it is considered that they are likely to occur in the dry tropics of Townsville. A study and assessment of their occurance is now underway by a JCU researcher - Lisa Gershwin. For more information and contacts see web page on freshwater jellyfish. TCC has initiated a series of responses for the management of inland waters and the urban stormwater quality. These responses include ongoing policy development, mapping, water quality monitoring, aquatic condition monitoring and ongoing evaluation. Such responses incorporate the need to carefully implement on-ground works in a cost effective manner, to avoid repeating mistakes of the past, which in some cases have been very costly. This will be achieved by employing innovative problem solving to deliver ecologically sustainable solutions now and into the future. This recognises that Council does not have the resources to remediate all past mistakes, but can progressively work on improving and rehabilitating local environments while ensuring that environmental impacts are reduced through new land use practices and water quality improvements. At the same time there is still a need to maintain and ensure efficiency in aquatic monitoring to improve available information on which to base better decision-making. Council has developed a Groundwater Policy in order to ensure environmental impacts are taken into account during development assessment. Council sited the Vantassel Landfill on older sediments associated with the Muntalunga Ranges in part due to the presence of good impermeable clay soils beneath the landfill. To ensure beach ridge groundwater is protected, stringent environmental conditions are placed on sand mining operations in the Clevedon-Cungulla area. Urban Stormwater Quality Management Plan. As required by State legislation (Environmental Protection Act 1994), Council has prepared an Urban Stormwater Quality Management Plan (USQMP). This plan, which has been reviewed by the Environmental Protection Agency, addresses many issues associated with managing stormwater in the local area. The plan focuses on priority sites (Lakes-Ross Creek; Louisa Creek; and Magnetic Island) and assesses available water quality data to set water quality objectives for the pollution management of catchments and waterways. The plan identifies specific water quality treatment measures for each component of each stormwater catchment system for which funding can be sought or allocated for such pollution mitigation works (litter, sediments, nutrients, & chemicals). A hierarchy of management plans developed under the auspice of the USQMP include the development of site specific management plans (Lakes, Louisa Creek) and integrated catchment management plans to manage and improve water quality and incorporate remediation programs to reduce the frequency and intensity of fish kills. The Atlas of Environmental Values (1998) provides important SOE information on the condition and pressures for 62 waterways and Wetland sites in the Townsville region. It is available on the web. The USQMP includes considerations for the ongoing development of site-specific environmental management plans for the Lakes and Ross Creek, Louisa Creek, Mundy Creek, and Gustav Creek. Displays and water monitoring presentations on special days which promote environmental awareness and responsibility (World Environment Day; Townsville Environment Week (Coast and Estuaries Day 2003 - USA and Ecofiesta; World Wetlands Day 2002; National Water Week 1999 and Seaweek). Council’s engineering business unit (Citiworks) is also working closely with TCC Environmental Management Services to develop and implement a Drainage and Waterways Management Plan. This plan forms the operational drainage management regime and complies with the planning elements of the USQMP. It also ensures Council’s day to day maintenance and management of drains, waterways and wetlands is consistent with sound environmental practices for seasonally wet environments. Staff from Council have been trained and procedures are in place to ensure environmental requirements are complied with. Council has recently built on the success of implementing this plan and attaining a multiple-site dredging permit from the Environmental Protection Agency for all drains, waterways and wetlands in Townsville. The implementation of this permit requires Council to manage water and aquatic impacts in a responsible manner. In 2000, as part of Council’s commitment to the Nelly Bay Harbour Development TCC also commissioned a Catchment Study into Gustav Creek. This study has already assisted Council in developing site-based management of Gustav Creek (sediment and pollutant management). In response to the many problems of a large urban environment situated within the local tropical flood plain, Council has initiated a program to improve water quality and aesthetic qualities of our local natural and man-made waterways. Consistent with the planning requirements of the Council’s USQMP identified priority sites, Council has commenced implementation (through NHT Clean Seas Program and Urban Stormwater Initiative (USI) funding) of two large scale stormwater management projects, Clean Seas Louisa Creek (TCC/NHT brochure and NHT Case Study) and CBD Urban Water Project (TCC/USI brochure and USI Case Study). See here for Stormwater Quality Management Site. A number of sites along Ross Creek have been identified, under the CBD Urban Waterway Project, for the application of best practice techniques in stormwater quality management. The project sites differ in their requirements, in terms of the pertinent issues, the proposed treatments to address these issues and the appropriate monitoring techniques. The aim of the project is to verify the effectiveness of Best Practice Stormwater Management techniques in the Tropics. Pollution hotspots have been targeted to reduce the impacts on our natural waterways. Litter, gross pollution traps and sediment ponds, have been incorporated with great success. 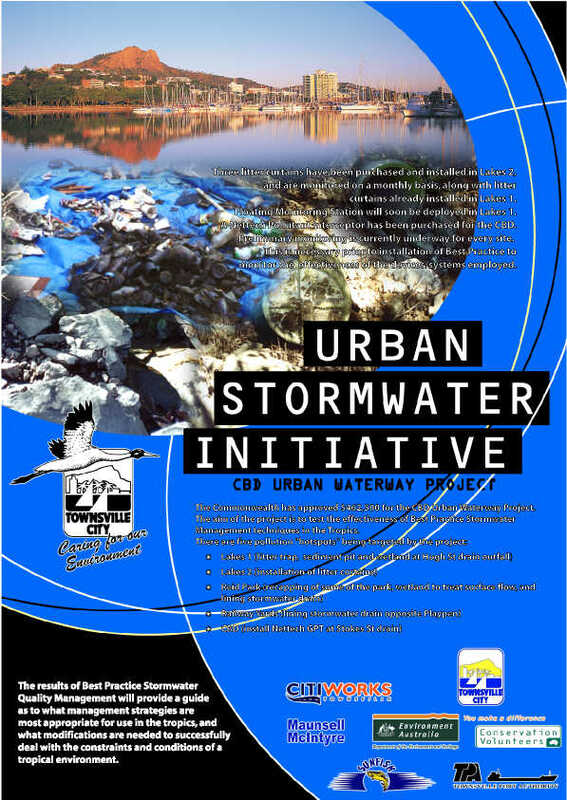 It is anticipated that the results of these projects, which demonstrate how we can manage urban stormwater and groundwater quality, will be feed into the Council's CBD Urban Renewal project (see CBD Master Plan) and will help ensure that CBD redevelopment projects are more able to focus on the waterway of Ross Creek and take account of opportunities to improve the environment for residents and industry. At a local scale TCC has an Emergency Response Manual detailing responsibilities for Council departments and services to react to spills and environmental incidents associated with Council activities such as road-works; wastewater management; and depots. The Manual also details Council responsibilities to support Main Roads and EPA for fish kills. An outstanding area of concern pollution incidents, which cannot be attributed to a specific source. Council is anticipating progress and agreement between the Local Government Association of Queensland (LGAQ) and EPA in determining a Memorandum of Understanding (MOU) for such incidents. At a regional level TCC also provides assistance when called upon for Marine Oil Spills in association with Townsville Port Authority, EPA and GBRMPA. All Council Environmentally Relevant Activities (ERAs) and IEMS depots and work have detailed procedures on reporting and handling of pollution spills. Council has implemented an Integrated Environmental Management System for all its ERAs and business activities. This includes Environmental Awareness Training for all Council staff which is now provided to new staff as part of induction training. The course is integrated as part of corporate training and responsibilities. Magnetic Island and Council mainland Parks Services depots. The management and implementation of these measures will provide significant environmental improvements and is consistent with the implementation of many workplace health and safety requirements. Council always seeks to ensure waterways are protected during development activities. This has been adopted as a planning outcome by the introduction of an Open Space Policy for development which ensures that riparian areas and wetlands are protected. Additionally, Council has introduced specific requirements under the City Plan for managing impacts on urban and rural waterways and wetlands. Council is working closely with the Haughton River Improvement Trust, Burdekin Shire Council, Dalrymple Shire Council, Department of Natural Resources and Natural Heritage Trust, to establish a Coordinated Catchment Committee and a Catchment Management Plan for the Haughton River Catchment (including Reid River and Majors Creek). Management of aquatic weeds, grasses and exotic fish fauna is a major concern. Management and control of introduced pest fish species falls under the Strategy for the Control of Pest Fish species in Queensland. Council undertakes specific events to assist with the reduction of pest fish in local waterways, examples include the Townsville Tilapia Competition for local juniors (an initiative of Sunfish Townsville Branch). Management of pest weeds and grasses directly benefits water quality objectives and is supported by revegetation projects in the Townsville region by joint community and Council initiatives. TCC Fishwatch has been set up as a network for local fishers and community interests to discuss recreational fishing and environmental conservation of fish stocks in the Townsville area. The network consists of members from a wide range of community groups, organisations and government. Visit TCC Fishwatch webpage to find out more about this TCC-Community recreational fishers initiatives and projects. The revegetation of our natural waterways not only contributes aesthetic improvement but also to the improvement of functioning ecosystems. Groups such as Tropical Urban Landcare Group (TUPALG) and local revegetation groups (Oak Valley Landcare; Kirrang Court; Marabou Drive; and Water Street) in partnership with Council have established 15 community groups with the Ross River catchment. These groups are encouraged to become involved in revegetation projects in their local areas, not only to improve aesthetic/amenity values but also to increase shading of our waterway sand to provide substantial buffer zones (which increases the area available for pollutant absorption of sediment and nutrients). In addition it is known that a greater diversity of plant species leaf litter incorporates direct benefits via secondary production in our waterways and consequently aquatic ecosystem health (ie. multiple species leaf litter leads to a greater diversity of micro-organisms that simple exotic grass systems). These community groups are planting as many as 5,000 local native trees per annum. Funding is provided by Townsville City Council and the Natural Heritage Trust. These buffer zones play an integral role in the interaction between aquatic and terrestrial zones, and riparian regeneration projects directly benefit water quality outcomes. Revegetation is also undertaken by Council staff through the Community Jobs Program (State government funded) and with Greencorp/Conservation Volunteers Australia (CVA) partnerships with TCC (Greencorps is a Commonwealth initiative). Groundwater. Council will seek to ensure that during development projects every effort is made to maximise ground water recharge options including detention basins; retention of natural vegetation, and water sensitive urban design features which reduce hard surfaces and maximise infiltration options. Integrated Catchment Management. Council will build on it’s USQMP (including urban catchment management initiatives and habitat retention objectives) and rural catchment approach (Haughton River Catchment Study and Catchment Coordinating Committee) and work with the community, State agencies and the Commonwealth (Mt Stuart Training Area) to ensure that catchments are protected and vegetation retained. Council will prioritise vegetation retention for catchment protection and place a high priority in considering significant vegetation areas under Local Law No.2 (Vegetation Management) and during development assessment under the City Plan. Aquatic Environments. Council will continue working with land owners and other government agencies to protect wetlands (Serpentine Lagoon, Town Common, South Bank and Ross Dam) to protect these important landscape features now and into the future. Council will assess the success of innovative approaches to mitigate and improve of local stormwater. Commonwealth and State funding will continue to be sought to further improve water quality. The current development of highly innovative wetland design will be incorporated in future wetlands to provide Townsville with better local water quality. The viability of fish ladders being installed at Aplin's Weir will be considered. This may allow a wider variety of local fish such as Jungle Perch, Bony bream, Mullet and Tarpon to migrate from existing habitats to breed, and return when reproduction is complete. This may benefits of regional recreational values of freshwater weirs. Curbing illegal discharges to stormwater drains and implementing new ‘Creek Watch’ and ‘Drain Watch’ programs. Undertake strategies to improve the quality of the waterways by clearing litter, maintaining creek banks and removing weeds so that waterways are safe to use for the community.